The lives of people in a sleepy English market town are brought into shocked disarray at the unearthing of a decomposing body found in a nearby cave. 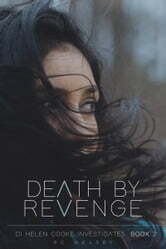 DI Helen Cooke who is investigating the recent disappearance of three local women begins to piece together connections once the identity of the corpse is realised. But what is that connection? One man clearly stands out in DI Cooke’s mind as the murderer but without any evidence against him, she is unable to make an arrest. When his own wife goes missing, Cooke and the team seize the opportunity to investigate further as they strive to find her. But where is she, and is she still alive? When her Senior Officer starts demanding results, Cooke must find the killer before they strike again. Something isn’t quite right, and with no more clues or clear motive, Cooke begins to doubt her ability to catch the murderer as the body count begins to rise. In this second book of the DI Helen Investigates series, RC Welsby writes an enthralling murder mystery that will have the reader on the edge of their seat until the very the end. Working through petty arguments and life-changing accusations, self-doubt and intense pressure, Cooke’s sheer determination brings her face-to-face with the real murderer, where she too must fight for her own survival. A “who dunnit?” story of murderous revenge that will keep the reader guessing throughout. After having recently read UNHOLY REVENGE: DI Helen Cooke Investigates (Book 1) by RC Welsby, I was looking forward to this second installment. She didn’t disappoint and I’m quickly becoming a fan of this author. Her writing style is hypnotic, and she draws her characters with great credibility and conviction. Author RC Welsby weaves yet another compelling and gripping tale of murder, mystery and suspense, with intriguing twists and turns that will easily captivate the reader's attention from the beginning. This time the author paints a dark story of murder beginning with the unearthing of a decomposing body found in a nearby cave. As DI Helen Cooke investigates the recent disappearance of three local women, she begins to piece together the connections once the identity of the victim is known. Can she find that connection? Well, since I don’t do spoilers you’ll have to turn the pages for yourself to find out! However, the book description does reveal a few clues: ‘One man stands out in DI Cooke’s mind as the murderer, but without any evidence against him, she is unable to make an arrest. When his own wife goes missing, Cooke and the team seize the opportunity to investigate further as they strive to find her. But where is she, and is she still alive? When her Senior Officer starts demanding results, Cooke must find the killer before they strike again. Something is not quite right, and with no more clues or clear motive, Cooke begins to doubt her ability to catch the murderer as the body count begins to rise…’ Now, if that’s not enough to get your curiosity juices flowing, I don’t know what will. But as I said, if you want to find out what happens you’ll have to turn the pages for yourself! But I will say this was another worthwhile read. It’s my second time reading this author and I must say I was very impressed yet again. This was another captivating read that had me engrossed from the beginning. The story flowed from scene to scene with ease, and the author displays excellent ability when it comes to storytelling. There are plenty of intriguing moments in this page turner that will take the reader on a compelling and gripping journey. It’s one of those books that come along once in a while that makes you want to read it non-stop until you get to the end. I’m giving nothing further away here. And this, I hope, will only add to the mystery and enjoyment for the reader. I will say, however, that fans of the mystery, thriller and suspense genre will love having a nibble on this one! I like these particular types of books because they become like a trusted and reliable old friend. But since this appears to be book 2 of 2, I guess this is where it ends? It’s a pity really, because I could easily find myself reading several of these novels. Maybe DI Helen Cooke will be called out of retirement again sometime in the future? We’ll have to wait and see. Nevertheless, I’ll be looking forward to reading more from RC Welsby in the future. I would definitely recommend this book and could easily see this being adapted as a television series or a made-for-TV movie. Five stars from me.